Back in May we posted about a proposed bike lane coming to Wabash between Roosevelt and Harrison. And today we're here to let you know that the bike lane has been created! For people in favor of more friendly pedestrian streets, you're probably happy. Besides the bike lanes being added, Wabash has been reduced to a single lane for cars in many places. Overall it's a much better experience for bikers and also pedestrians in our opinion. Drivers might not be as happy as we've already noticed longer waits at stop signs and lights along Wabash. With the addition of the bike lane North of Roosevelt, there is now a solid stretch of "buffered" protection for bikers from 18th street all the way to Harrison (which is just over a mile long). Good addition to the hood if you ask us! 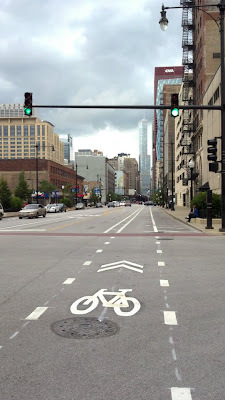 There is now a bike lane on Wabash south of 18th to Cermak (that section of Wabash was recently repaved). So I guess the bike lane extends from Harrison to Cermak now, about 1.5 miles. The one lane on Wabash, though, does slow down traffic quite a bit, like at the 13th St intersection 4-way stop sign. Also, didn't it used to be two lanes on Wabash at Harrison going straight where it changes from a one-way to a two-way street? That's a bottleneck during rush hour now. This should've been here from the start. There was no reason when they finished the streetscaping back in 2010 to mark Wabash as two lanes each direction. The center lanes seem to always be stopped because of a turning vehicle, so the replacement of one travel lane in each direction with a single turn lane is a fair trade in my book. Also, with the bike lane south of Roosevelt, it again makes sense to keep this going north. Next on my list is seeing Harrison west of State be completely redone. Just as a two lane road (Wabash) sandwiched in between another 2 lane (State) and 3 lane (Michigan) roadway made no sense, Harrison being 2 lanes sandwiched in between Congress (3-4 lane) and Roosevelt (2-3 lane) makes equally no sense. Now that Congress is fully open again, streetscape Harrison to improve it's pedestrian friendliness for all the college students and families in the Sloop. Add trees and vegetation, get rid of the slopey AT&T sidewalk, add in some handicap ramps, fix the holes in front of Chase, and reduce it to two travel lanes and at least a buffered bike lane.